Steven Yeun has spoken about Glenn’s “iconic” death scene at the hands of Negan in The Walking Dead season seven. “You read that comic, you kind of don’t want that to go to anyone else. It’s such an iconic moment and I think I even said, ‘Don’t give that to anybody else’. It’s such a gnarly thing to say but sincerely, living that out was very wild but at the same time, that moment happening and being realised on television in a different medium and to do it in the way that we did it I think is brave and at the same time super affecting. And for me, that was the motivation to be like, ‘Yeah, that sounds great’. However, Yeun admitted he struggled with maintaining the secrecy around his character’s exit and eventually had to stop talking to people who might ask questions. 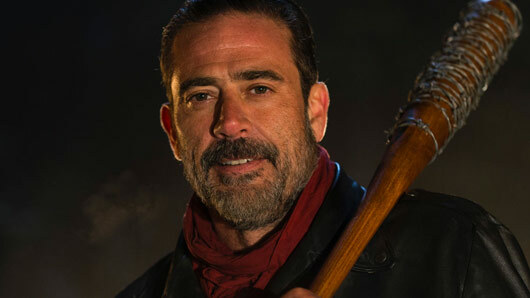 Meanwhile, fellow Negan victim Michael Cudlitz has revealed that the cast have known the identity of Negan’s victim for nearly a year. The Walking Dead continues Monday at 9pm on FOX UK.